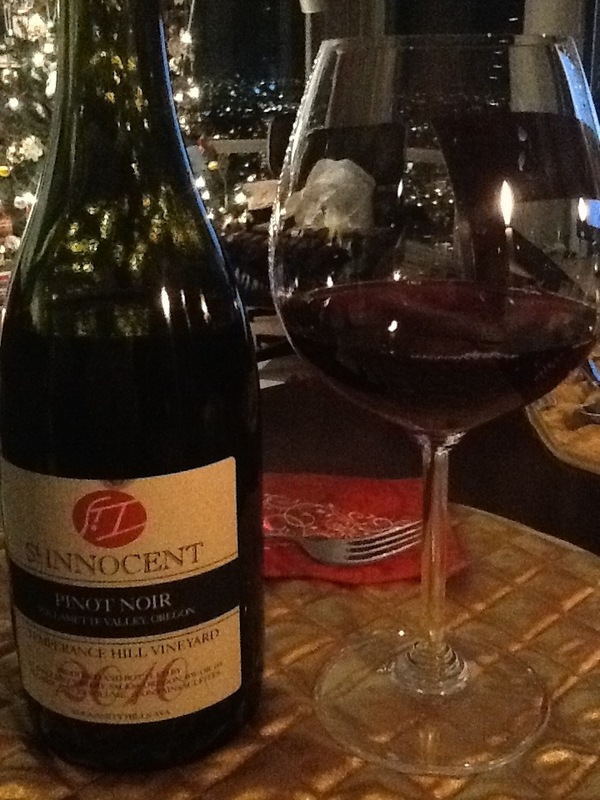 St Innocent, Pinot Noir, Temperance Hill Vineyard, Eola-Amity Hills AVA, Willamette Valley, Oregon, 2010, 13% abv. Oh second Christmas, we love you. With Alison and Lauren here for our belated Christmas celebration, we needed a Pinot Noir to accompany the salmon fillets encrusted with pistachios, curry and maple syrup. The Eola-Amity Hills AVA is close to Salem and with a trip on the horizon, I had to try this out in advance. How fortuitous there’s one sitting in the cellar. Clear and bright, the St. Innocent is on the pale end of garnet with quick legs. Its nose shows aromas of ripe red plums, dark cherries and toasty oak. On the dry palate, there’s good acidity and light, silky tannins with flavours of more ripe, red fruit – plum, pomegranate – and black cherries with some black currant. Some light moss and undergrowth with a hint of savoury mushroom topped off by a medium plus finish. A WSET Very Good wine. Elegant and fruity but with undertones that will age beautifully if you can be patient. I couldn’t wait. This entry was posted in Oregon, Pinot Noir, RED and tagged Eola-Amity Hills, oregon, pinot noir, red wine, St Innocent, Temperance Hill Vineyard, Willamette Valley. Bookmark the permalink.